The most detailed and literary diaries of all the occupants of 10 Downing Street were those kept by Harold Macmillan and William Gladstone. There are, however, two significant differences between these prime ministerial diaries. Gladstone kept a diary throughout his life. Macmillan’s was discontinuous. During the Great War he effectively began keeping a diary in form of letters home from the front to his mother. Macmillan’s War Diaries detailing his service as Minister Resident in Algiers, Greece and Italy in 1943-45 similarly began as letters to his wife Dorothy, before becoming a regular daily journal. In 1945, however, this diary abruptly stopped. It was not until August 1950, that Macmillan began a much more self-conscious record of his activities, written up in black-bound notebooks in his somewhat unsteady scrawl (he was wounded in the right hand at the Battle of Loos in 1915). There are 22 of these notebooks covering Macmillan’s ascent to the premiership on 10 January 1957. A further 23 describe his premiership down to his resignation on 18 October 1963. The last three notebooks record Macmillan’s political and business activities following his return to run the family publishing firm, up to May 1966. In total they run to just under a million words. Macmillan’s publishing connection probably lies behind the other contrast with the Gladstone diaries. Both men were voluminous readers, conscientiously recording every book they devoured. Macmillan would also usually add a pithy summary. As well as demonstrating his ability to condense complex documents, these entries also provided an opportunity for reflection on current policy problems. Reading was Macmillan’s principal pastime, relaxation and means of coping with the pressures of office. For instance, faced with criticism from his party and across the Commonwealth over his European policy he commented on 22 September 1962: ‘Severe crisis – personal or political, makes [Sir Walter] Scott a necessity’. Macmillan may have been a consummate performer on television, but the only television he possessed was in the servants’ hall of his country house, Birch Grove. It is clear from Macmillan’s reading how highly he valued resilience of character. Among his favourite reading matter were memoirs, diaries and letters. It is unclear whether this helped to prompt him to start his own. Macmillan was to find his diaries a valuable resource for the six volumes of memoirs he produced in retirement. Publication of extensive extracts from the diaries in these memoirs between 1966 and 1973 first drew attention to the rich insights these offered both to the business of government and international relations in the 1950s and 1960s, and to Macmillan’s view of the people and problems he encountered. Hitherto, only a few Cabinet colleagues had even suspected Macmillan of keeping a diary. He could find the process a chore, but Macmillan nevertheless frequently managed to write up entries in the evening, almost contemporaneous with the events described. During his premiership the entries often have a more reflective tone, and many seem to have been written up at weekends. Sometimes Macmillan used his diary as private means of venting his frustrations with colleagues, international counterparts such as President Charles de Gaulle of France, or even with himself. Generally, however, the diaries were used to sort out his thoughts, or to try to plumb the motives and manoeuvres of political opponents at home or abroad. Occasionally the pressure of events and resulting stress proved too much. Macmillan waited a week after the height of the Cuban missile crisis before penning a lengthy discussion of its likely causes and consequences. It took nearly a month from his accession to the premiership before Macmillan on 3 February 1957 set down his thoughts on this process. This was also his first entry since 4 October 1956, the last entry in the 22nd diary notebook. He later claimed that the next notebook dealing with the climax and immediate aftermath of the Suez crisis that led to him replacing Eden as Prime Minister was lost, but it seems more probable that he destroyed it. There appears to be one other deliberate omission. Macmillan’s diaries are personal as well as political, if somewhat selectively. The diary only hints at his wife's long-standing affair with Bob Boothby, a fellow Conservative politician. These difficulties may also explain why Macmillan needed the emotional release writing a diary provided: it seems no coincidence that the final entry was for the day before Lady Dorothy’s fatal heart attack. Generally Macmillan gave most weight to what was politically important to him. 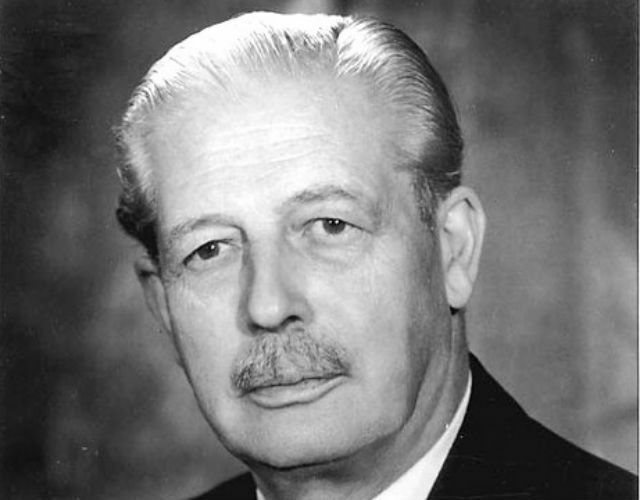 Controversial matters within the Conservative Party, such as the crisis in Central Africa, when white minorities opposed Macmillan's policy of independence for African colonies, absorbed huge amounts of his energies and swathes of the diaries. In contrast, his government’s decision to go ahead with the Anglo-French project for a supersonic jet was only mentioned when it became controversial under the incoming Labour government of Harold Wilson in 1964. The diary concentrates on the problems facing the prime minister, rather than the range of decisions he had to make. Yet the diaries do not just reflect reactively on these problems. They can also be used to discern his long-term strategic anxieties and priorities. Therefore, particularly during his premiership, there is a bias towards foreign, imperial and economic affairs. Problems of party and Cabinet management are also fully covered. Repeated themes emerge. One was the long shadow cast by the Great War both over his own life and over Europe. Another was his resulting anxiety about European decline and the rise instead of the Cold War rivalry of Russia and America. His concern in the late 1940s and early 1950s to try to find a way of building up a counterweight through linking the Commonwealth with Europe, which would help Europe to rebuild while retaining Britain’s existing imperial economic ties, was very much conceived within this context. For these reasons Macmillan always favoured a wider and looser European unity than that pursued by the six powers that came together to form the European Economic Community in 1957. European integration was thus for Macmillan part of an interlocking ‘Grand Design’. This term had been repeatedly used by Macmillan to describe a complex related series of proposals designed to address a range of political and policy problems. In his ‘Grand Design’ paper of December 1960, for instance, the negotiations over Britain's possible entry into the European Economic Community were seen as a way to promote liberalisation of international trade in order to assist the British economy. EEC membership was also a way to consolidate resistance to Communism both in the West and in former colonies and thereby help to reduce the military costs of the Cold War, not least for the British themselves. Macmillan later contemplated entitling his final volume of memoirs ‘The Grand Design’, dropping this idea when he reflected that ‘since most of my plans failed it might seem rather ridiculous’. At least he had the breadth of vision to try to make such plans, as well as the self-deprecating humour to manage both his successes and failures. These are qualities which come out very clearly in the diaries. Some less attractive features of his personality also emerge from their pages, such as occasional moments of anti-Semitism. The diaries can be used to illustrate Macmillan’s political techniques, such as his use of the launch of the Russian satellite Sputnik in 1957 to drive the resumption of nuclear information sharing with the Americans. They also demonstrate his awareness of the changing nature of his office: on 8 November 1958, after attending the Festival of Remembrance, a tribute to victims of war and members of the armed forces, he commented, ‘All these ceremonial duties and functions are becoming more and more oppressive to a Prime Minister and make it necessary to work further and further into the night’. The diaries are similarly crowded with pithy reflections on the changing nature of the Commonwealth, of international negotiations and of the many statesmen Macmillan dealt with. The challenges facing Macmillan are palpable in his pages. So are the ways he tried to tackle them. They are frequently enlivened by Macmillan’s dry wit. Above all, they act as a direct witness, compiled largely under the pressure of events, to life during Macmillan’s premiership. A very disappointing month (January) Exports level; imports a great deal up. Trade gap £67m. No increase in production. However, some experts prophecy an improvement soon. If only all the people who write, lecture, broadcast, and even preach about economic growth did some useful work, the increase in man-power w[oul]d perhaps enable us to achieve it.